The Welsh government is committed to creating a continuous 850-mile path around the entire coastline of Wales by 2012. Work has been proceeding apace over the last few years, with missing sections completed between Prestatyn and Llandudno, Amroth and Pendine, Burry Port and Llanelli, Llanmadoc and Port Eynon, Port Talbot and Porthcawl and Aberthaw and Barry. Even the tricky Flintshire coast between Connah’s Quay and Point of Ayr is being dealt with, but I fear that there’s a section that will frustrate the whole project: the Cardiff coast. Yes: Cardiff has a coast. You wouldn’t know it though, because strenuous efforts are devoted to making sure nobody is aware of its existence. 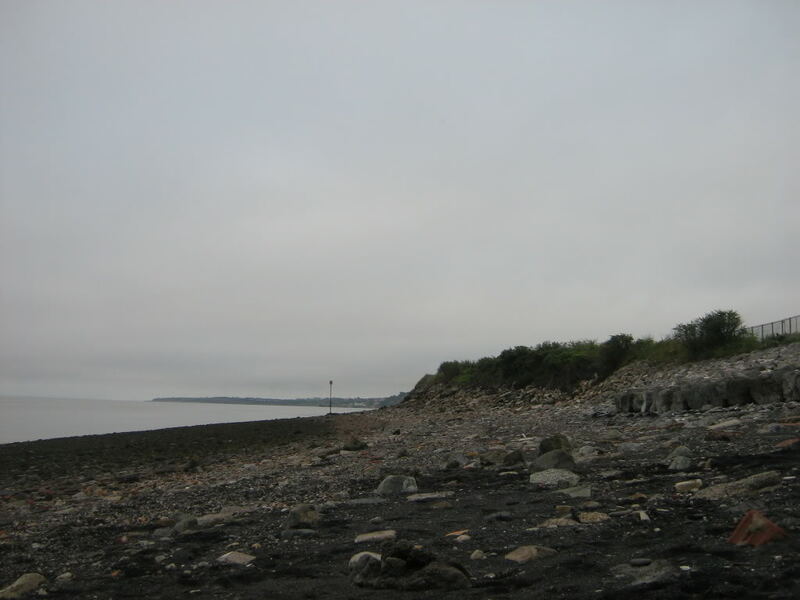 The south-east facing, three-mile stretch of coastline between the mouths of the Taff and Rhymni rivers is practically impossible to access unless you are prepared to trespass, sneak around the back of grim workshops and scramble over litter-encrusted mounds*. Then, quite suddenly, there it is before you: Cardiff’s forbidden and forsaken foreshore. The first shock is to see once more a substance presumed to have been banished from Cardiff: coal. The carboniferous rock may no longer make the rivers run black, but 150 years of slurry pouring down from the valleys didn’t just disappear into thin air. Out it went into the Severn, there to fan out across the inter-tidal muds and be deposited by currents along this shore. When the tide is out here is the world’s only coal and brick beach, a black and orange travesty sprinkled with concrete rubble, twisted wires, fused iron slag and industrial debris, all being gradually worn into grotesque craggy shapes by the action of the sea. Rio has the Copacabana, Venice has the Lido, Sydney has Bondi, New York has Coney Island, even inland Paris has the man-made Plage on the Seine; as for Cardiff, it has Splott Beach – the most desecrated, poisonous and ravaged coast this side of the Niger delta. No wonder they don’t want you to see it. Cardiff de-industrialised gracelessly and on the cheap. Out of sight, out of mind was the attitude when the vast East Moors steelworks was demolished. Everything was just bulldozed over the low cliffs. The same policy prevailed when the Rover car plant and other smaller factories shut in the 1980s. 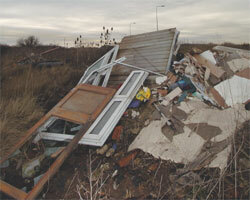 The dumping and tipping continued into the 1990s as the biscuit factory and Spillers mill were chucked over the edge. The planners decreed that this coast was to be abandoned and what little remained of Cardiff industry was to be concentrated here. Up went aggressive security fencing and platoons of cheap factory units, most of which today stand empty and to let. A heliport was built to trumpeting assurances that important high-flyers would be popping in and out regularly – of course no such thing happened, the only takers being South Wales Police, as keen on keeping Cardiff awake at night with their deafening machines as they are reluctant to do any work down on the streets. Meanwhile, Associated British Ports (ABP), who acquired vast tracts of this area thanks to privatisations and asset-stripping takeovers, took control of the western half of the Cardiff foreshore alongside Queen Alexandra Dock. Refusing to provide even the paltry unofficial coast path there is towards the mouth of the Rhymni (out of the question, it might shave a penny off shareholders’ dividends), ABP instead give us oil storage tanks, scrap yards, malodorous recycling plants, belligerent heavies and avalanches of debris tumbling into the sad Severn sea. Heading east, a rat-infested, garbage-choked perfunctory track worn by the feet of defiant anglers passes a man-made cove where Cardiff’s main outfall sewer meets the Severn. This is a feature of such unimaginable hideousness that it really has to be seen to be believed. Once part of the Orchard Ledges, so called because of their rich pickings of fish, the inlet has been known as Moyle Bay, after a renowned foreshore fisherman of old, and also as The Gut, by local boys who would bravely swim here when the tide was ebbing and the sluice gate was shut; now the Council has decided it is to be named, wait for it, Heliport Bay. I don’t think so. On the eastern side of The Gut (that’s what I’m going to call it) squats the Tremorfa sewage works with its clutch of ugly buildings, churning brown ponds and indescribable stench. Next comes the sinister Celsa works (the 4th biggest building in Cardiff), where ferrous metals are melted down and the terrifying chimneys deposit a fine coating of dust everywhere. Then you pass beneath the 15 hectare ‘frag tip’ of toxic waste topped with clay where off road motorbikes shriek and snarl on precipitous dirt tracks while the roaring major lorry route of Rover Way forms an impenetrable barrier to the north, before eventually reaching the pitiful collection of mud-splattered cabins where the once-proud Glamorgan gypsies must now subsist – so horrendous is the eco-holocaust here that the council deemed it the perfect location for a gypsy site. These are the only sea-shore dwellings in all of Cardiff, a privilege paid for with ill health and social isolation. Bedraggled ponies chew the manky turf surrounded by smouldering heaps of fly-tipped tyres and plastics before you arrive at the mouth of the Rhymni, the last tidal Cardiff river since the building of the barrage, still retaining some of its gloriously muddy natural condition as it meanders to the sea. At the spectacular confluence the menacing brown waters carve a crazy, treacherous amalgam of swirling currents and shifting mud-banks overlooked by the towering hill of Cardiff’s refuse at Lamby Way. Here the sea walls are barricaded by fencing and razor wire barring any further progress. If, out of all this, the Welsh government can make a viable coast path that anyone would want to walk, then I’m a Dutchman’s uncle (note to self: must remember nephew Ruud’s birthday). Seriously though, what is urgently needed is not some gimmicky, inevitably compromised path but the complete restoration of Cardiff’s tragic coastline and its lost mud-flats and salt-marshes. Firstly, this will require an acceptance of the fact that Cardiff is by the sea instead of futile strivings to keep the sea out – efforts that have only put Cardiff in more danger of catastrophic flooding. Burying the moors means we have lost the natural sponge that could deal with floods, barricading the foreshore hastens erosion, building the barrage piles up sediment along the coast as the Severn compensates for the loss of the Taff/Ely estuary, channelling the rivers makes them flow faster with more destructive potential. The successful rescue in the last 20 years of the equally mutilated coast between the rivers Tyne and Tees in north-east England shows what is possible if the will is there. An example closer to home is the clearing of the slag heaps from the mining valleys of Glamorgan and Gwent. But we’re a lazy, complacent species. It took the horror of Aberfan to bring down the slag heaps. Will Cardiff have to endure the New Orleans experience before we act? A good read. We also need acceptance that Cardiff has rivers running though it ! Found you after seeing Wales Online article* which has the great first sentence of “IT [sic] was once a black wasteground [sic] filled with the slurry of Cardiff’s industrial past.” Aha, still is ! Even suggests Cardiff residents should visit ! I can see it now, crowds skipping down Ocean Way, spade and bucket in hand . . . . . It has to be a typical Echo stitch-up, designed to make the LibDem look as foolish as possible…surely?? Cardiff’s not the only place where the coast path will be compromised. Apparently a number of large estates in Anglesey and Gwynedd have refused to allow access, and the Welsh government shows no sign of using the Marine and Coastal Access Act 2009 to force them to open up their land. It’s quite sickening when you consider where the money to build these estates came from.